CAMBRIDGE, Mass. -- Firefighters battled a massive 10-alarm fire Saturday just outside Boston that started in the afternoon and raged on into the night, but ended up with what the fire chief called a “miraculous” outcome. The fire was reported just before 3 p.m. on Berkshire Street and reached nine alarms about 30 minutes later, and eventually hit 10 alarms. The flames were lessened but still burning as of 11 p.m. Officials say the blaze Saturday is the largest Cambridge has seen since the 1980s, reports CBS Boston. Flames extended to as many as 11 buildings in the area and several cars, according to Cambridge Fire Chief Gerald Reardon, as more than 130 firefighters from 17 or 18 companies worked to put out the blaze. It’s unclear what the extent of the damage is. Power was shut off in the area of the fire because of overhead wires, and was expected to be out for the majority of the night. According to Eversource, 1,659 people in the area were without power at one point. As of 9 p.m., that number had dropped to 869. Firefighters are working with Eversource to make a plan to restore power to as many buildings as possible. One of the buildings on fire collapsed completely, while others suffered partial collapse. According to the fire chief, there was construction happening in one of the buildings. 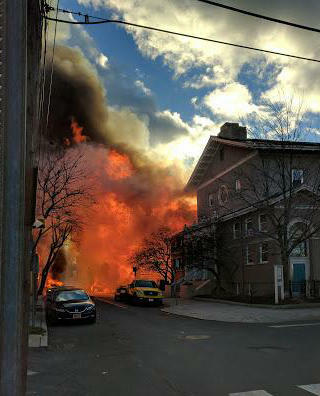 Another of the buildings engulfed in flames is an old church that has been converted to apartment buildings, but most of the buildings on fire were three-story homes. Reardon said there were five or six injuries from the fire, though none of the injuries were serious. All of the injured were treated by medics and released. A fire of this size without death, Reardon said, is a miracle. Flames spread quickly, carried by the wind, residents say. The damage, which Reardon said varies from significant to total, is emotionally taxing for the resident. Firefighters were called in from Newton, Waltham, Wakefield, and multiple other towns. Saturday night, Cambridge Mayor Denise Simmons said the city is housing residents affected by the fire. The city has also started a relief fund for the victims. People can donate to the fund at Cambridgema.gov/firefund. Reardon said more than 60 people live in the buildings that burned.